Begin by selecting Edit [rota] from the Edit menu at the top of the rota page. On the Edit rota pop-up window, change the rota Order By from Name to Role and then click Save Changes. The rota is re-ordered and this setting will be remembered each time you view the rota. The rota's order is also respected in reports, including the rota Overview report, and also when viewing the rota in the My Rotas section of My ChurchSuite. 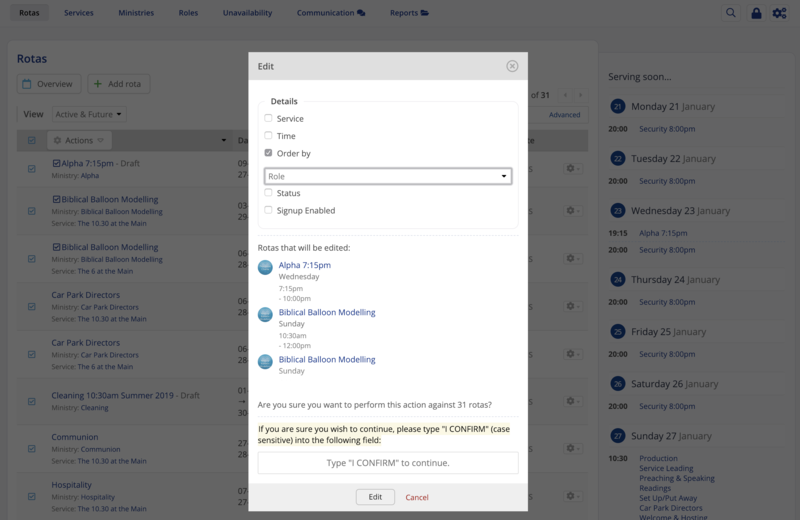 Note: You can temporarily change the rota order using the Order filter options at the top of the rota Dates page, however this filter is only applied while the rota is being viewed, and will revert to the rota's default order setting when the page is closed. Therefore, to make the rota order default to your preferred order, be sure to follow the instructions above and Edit the rota's settings. You can make batch changes to the order of multiple rotas, or even all rotas, using the module's batch actions. Click through to the Rotas list. You may wish to first filter the list of rotas using Advanced Search. When viewing the list of rotas, click the checkbox for each rota that you wish to batch update, or click to select all rotas being viewed. From the Actions menu select Edit. You can then select which batch actions are to be applied to the selected rotas. In the example below we are batch-editing the Order by field to Role order. Type I CONFIRM to confirm the action and click Edit to to process the changes. A progress indicator will show the batch actions being performed. Do not interrupt the process. A success message is displayed at the end to confirm all the selected rota's have been updated. 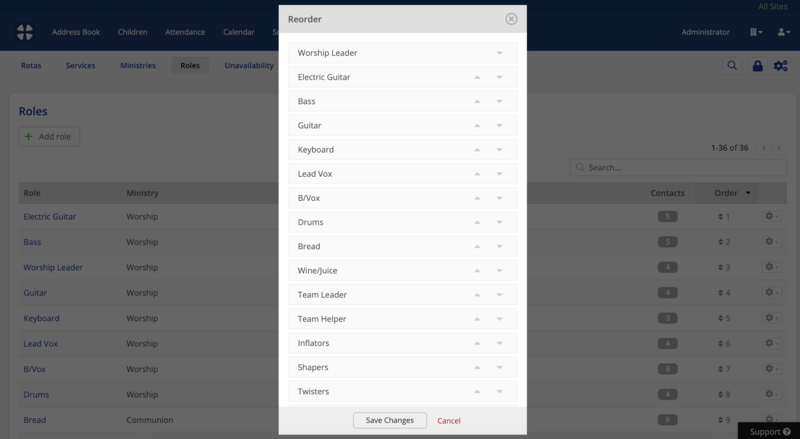 You can also change the order of your roles within a rota, so that key roles such as "team leader" or "worship leader" are sorted to the top of the list of rota members within each date on the rota. For example, you may be able to survive without an electric guitarist in your worship band for a week, but not spotting that you don't have a worship leader could be a real problem! 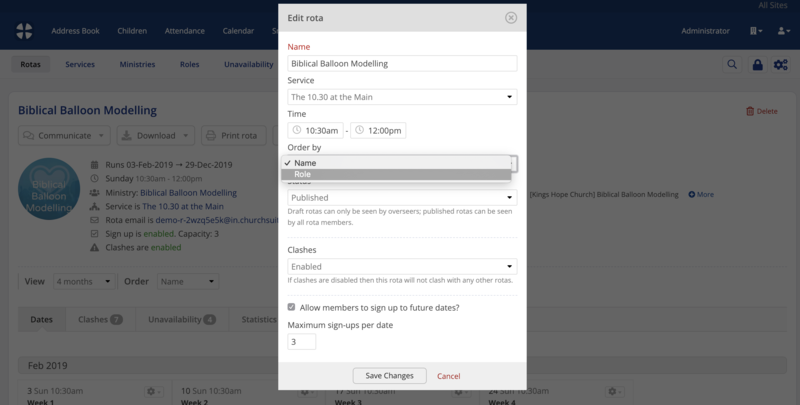 To change the order of roles head to the Roles section of the Rotas module in ChurchSuite.